Heart’s Delight – Discount Tickets! Here at Terroirist, we’re big supporters of Heart’s Delight, a four-day celebration in Washington, DC that brings together winemakers, celebrity chefs, gourmands, and wine enthusiasts to raise money for the American Heart Association. The week culminates with a Grand Tasting Reception and Auction on Saturday, May 3rd. Guests will enjoy wine from a host of outstanding producers. For fortification, attendees will be able to munch on delicious bites from exceptional chefs such as Chicago’s Graham Elliot, San Francisco’s Stuart Brioza and Nicole Krasinski of State Bird Provisions, and local favorites like R.J. Cooper of ROGUE 24 and Michael Friedman of The Red Hen. During the reception, guests can peruse the many wonderful silent auction items available for bidding. Later in the evening, a live auction will feature a number of impressive trips, experiences and of course, wine! So, if you live in the Metro Washington area — or want to make a weekend trip! — please consider buying a ticket and joining us for what promises to be another fantastic year of Heart’s Delight. We hope to see you there! *Discount only applies to the Tasting Reception & Auctions ticket, not the other portion’s of Saturday’s event lineup. If you purchase a ticket at $125, it will not be tax deductible. You can purchase a full price ticket for $250 and $125 of the cost may be tax deductible. Consult a tax professional for guidance. Method not actually endorsed by Terroirist! “Wine reviewers should spend more time with wines they are reviewing just like book reviewers spend hours, if not days, with the books they review. They should aim to be more than just reviewers, but actual writers. Just as with [a] book, not all the subtleties of a wine are noticeable at first.” Kyle Schlachter envisions a new type of wine review. I agree. In Chasing the Vine, Lauren Mowery catches up with Erin Scala, “a female force on the NYC sommelier scene [who now runs] the wine show at The Musket Room” in New York City. In Wine-Searcher, Adam Lechmere chats with Serena Sutcliffe MW, who has been Sotheby’s international wine specialist since 1991. On Palate Press, Kristina Anderson profiles Josh Phelps and Carlo Trinchero, the two friends behind Taken Wine Company. “Napa County needs to think about ways of diversifying its economy.” That’s the advice attendees at the Napa Chamber of Commerce’s “Innovation Napa Valley Conference” heard from economist Robert Eyler, Ph.D., of Sonoma State University. This summer, a groundbreaking wine device was released after years of research, and it immediately took the wine world by storm. Online bulletin boards started buzzing, sommeliers started salivating, and collectors clamored to get their hands on one. So much has already been written about the Coravin that there’s not much more to be said about the device itself. In short, the Coravin was invented by a medical device entrepreneur as a way to access wine in a bottle without removing the cork, by piercing the enclosure with a slender hollow needle and injecting Argon gas that displaces the wine that is forced out. Restaurants were basically the laboratories for testing the Coravin. Del Posto, the elegant temple of Italian cuisine in Manhattan, has been offering wines by the glass using a Coravin for the last year. The list includes glasses of Piedmontese superstars like Gaja and Conterno for $200. Like Eric Asimov, who was skeptical of astronomic by-the-glass prices at NoMad, I was not convinced that simply using a Coravin to serve a traditional 6-ounce pour would reinvent restaurant wine programs. Enter barmini by José Andrés. The Spanish chef, long known for pushing traditional boundaries in his cuisine, has established a “cocktail lab” next door to his molecular gastronomy showcase, minibar. 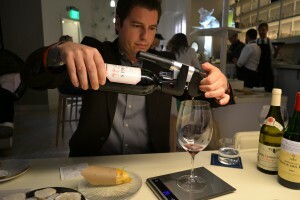 Under wine director Lucas Paya, barmini is using the Coravin in the most innovative way I have seen. With those words, Ray Walker did it. Unhappy in his conventional office job, Walker decided to walk out and instead pursue his dream of making wine, becoming a hero to all of us who have ever gazed out the window (or over the cubicle wall) and wondered if there was something more and better out there for us. Walker’s is a story that will hit too close to home to many wine-loving office drones. There were a couple problems, though. First, Walker had no experience, no job prospects, and limited connections to the wine industry. Second, he had a wife who was seven months pregnant and had a job that could not support a family on her own. 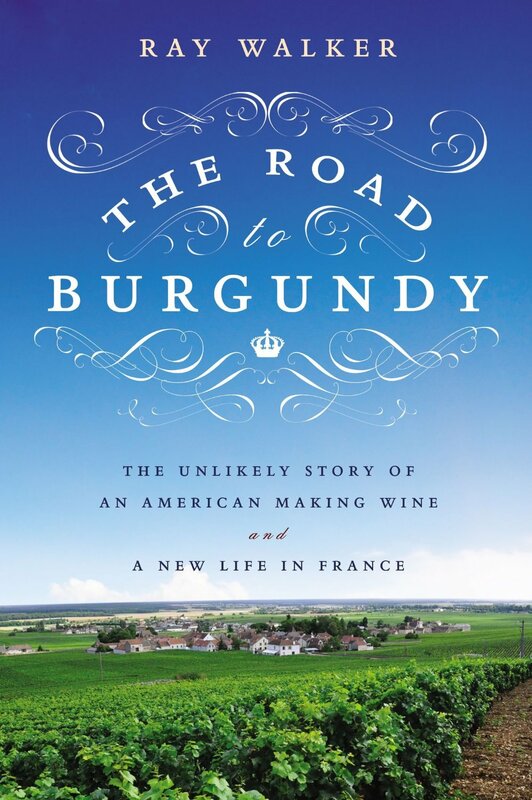 With those words, Christian Walker became the first of many heroes in “The Road to Burgundy: The Unlikely Story of an American Making Wine and a New Life in France.” From letting Ray quit his job with no other position lined up, to convincing him to purchase Chambertin grapes without having funds in place, to allowing him to rent them a house sight unseen in Nuits-Saint-Georges, Christian was the very picture of a loving and supportive wife, without whom all of this – the new career in winemaking, the winery in Burgundy, called Maison Ilan, and in turn this book – would never have been possible. Make no mistake, though, there is no shortage of champions throughout Walker’s tale. First, there’s Ed Kurtzman, the winemaker and partner in August West, a San Francisco-based winery. Kurtzman provided Walker with a harvest job for fifteen dollars an hour – the one (and only) winery position Walker would have before launching his own winemaking operation, thereby solving the first problem alluded to above. Then there are all of the people who helped Walker once he made his way to France: Olivier Leflaive, the famed producer of white Burgundy, who gave Walker and his family a place to stay while looking for grapes; Roz Seysses of Domaine Dujac, who convinced Walker to think bigger than just village wine; Thomas and his father Dominique, the courtiers who arranged for Walker to purchase the grapes for his first vintage harvest; Dave Warco and the other nameless investors who loaned Walker the money to get his upstart operation running; Fabrice from the Chamber of Commerce, who helped Walker navigate the byzantine French business laws; and Pierre, who rented Walker space in his cellar to crush and ferment his first wines. Many of us are already familiar with the basics of Walker’s tale; after all, he has been profiled in The New York Times, featured on Anthony Bourdain’s “No Reservations,” and of course interviewed right here at Terroirist. However, I had no idea just how many obstacles Walker had to overcome to produce the bottles that are now resting in our cellars. The second half of the book is a breathtaking series of events – pratfalls, near misses, and sleepless nights – that must be read to be believed. Naturally, given his ultimate success, the real protagonist of this story is Ray Walker himself. His journey from suit and tie to wine-soaked Led Zeppelin t-shirt will sound all too familiar to the wine geeks among us. Walker went from thinking red wine was disgusting, and wine drinkers pretentious, to gradually becoming obsessed with wine. The catalyst was an engagement trip to Italy, where Ray and Christian learned the magic of wine and food pairing. Upon returning, Walker dove headfirst into the world of wine tasting, gadgets and online wine bulletin boards. He started, as many of us do, with Bordeaux before discovering Burgundy. “Bro, you just got yourself an expensive hobby,” said Justin, the store clerk who poured Walker his first taste of Meursault. Like I said, this story hits close to home. His humility aside, Walker’s story is no doubt heroic in the true sense of the word: he made bold decisions resulting in a dramatic story that is as compelling as it is unlikely. For a first time author, his book is well crafted in an eminently readable (I finished it in two days), entertaining way. But like his winemaking, in which Walker says his job is “to simply get out of the way,” my sense is that the writing of this book was much the same. If you have a story as good as Walker’s, it pretty much writes itself. Walker was just the shepherd. 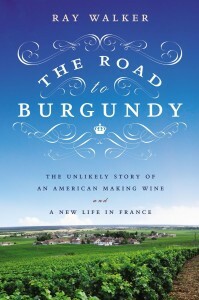 Terroirist.com received a preview copy of “The Road to Burgundy” from the publisher. It is available for pre-order now and will be on sale in stores this Thursday, July 11. 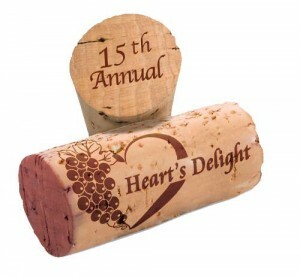 Heart’s Delight Wine Tasting & Auction: Discount Tickets! Here at Terroirist, we are big supporters of the Heart’s Delight Wine Tasting & Auction, Washington, DC’s premiere wine and food event that we wrote about last year. To refresh you, Heart’s Delight is a four-day celebration bringing together winemakers, celebrity chefs, gourmands, and wine enthusiasts to raise money for the American Heart Association. The week culminates with a Grand Tasting Reception and Auction on Saturday, May 4th. Guests will enjoy wine from outstanding producers such as Château Pontet-Canet and Château Léoville Poyferré from Bordeaux, Chile’s Concha y Toro, and Argentina’s Bodegas Catena Zapata. From closer to home, local brewery DC Brau Brewing Company will be pouring its well-regarded craft beers. For fortification, attendees will be able to munch on delicious bites from exceptional chefs such as Chicago’s Graham Elliot, New York’s Gabrielle Hamilton of PRUNE, and local favorites like Sebastien Archambault of Blue Duck Tavern. During the reception, guests can peruse the many wonderful silent auction items available for bidding, including bottles of Krug Champagne, a case of Château Cos d’Estournel, several great trips and many restaurant packages. Later in the evening, a live auction will feature even more impressive trip packages, experiences and of course, wine! Some of the best lots include a VIP dinner at New York’s Gramercy Tavern including 18 vintages of La Mission Haut Brion going back to 1948, two cases of high-scoring 2010 Bordeaux, and an insider’s trip to Italy, including VIP tastings in Tuscany. 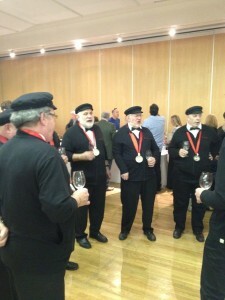 Les Chanteurs de Bourgogne: they drink, then they sing! Despite it being my first time, I felt I was adequately prepared for the Paulée experience, and upon reflection, I think I was able to make the most of it. There’s a fair amount of misperception out there about the event, so in the spirit of sharing, I offer this list of ten suggestions for how to maximize your enjoyment at what is the greatest wine event in the country. Johnnes says La Paulée is intended to evoke “the Burgundy spirit of generosity and camaraderie.” And there’s no better way to capture that spirit than to share a glass with friends. Having Burg-loving companions with you for these events makes everything better. You can certainly make lots of new friends (more on that below), but it is a lot more fun to have someone you know around to debate the current vintage at a tasting, discuss the wines being passed at a dinner, and join forces when moving around in search of pours at the Gala. DON’T: Spend your money on the rare wine dinners or lunches! As I mentioned, the Gala is the main attraction of La Paulée, but there’s a lot more going on, most of which is absurdly expensive. For example, Wednesday night included a “Rare Wine Dinner” featuring Champagne Salon, a vertical of Dauvissat Chablis going back to 1983, and a ridiculous selection of Roumier wines, including a 1955 Bonnes Mares, all direct from the domaines’ cellars. The price for admission? $4,750 per person. Friday night featured a similar “Legends Dinner” for the same price, but this time the wines were from Domaine Leflaive and the legendary Domaine de la Romanée-Conti. I don’t know about you, but $5,000 is a lot of money to spend on a dinner, even if it does include three older vintages of La Tâche (1971, 1978 and 1985). Here’s the thing, though: all told, the dinners are not a very good value, and you have no control over the wine and food. So here’s my suggestion—and one that more and more Burg-o-philes have been choosing in recent years—skip the pricey “official” events, make a reservation at one of the scores of great restaurants in Manhattan, and bring some great bottles to enjoy with friends in a more relaxed setting. That’s exactly what my group did this year, at the wonderful Corton in Tribeca, where we popped the corks on some great bottles, including a magnum of 1982 Pierre Gimonnet Champagne, a 1990 Leflaive Pucelles (older than any of the Pucelles at the “Legends” Dinner), a 1990 Leroy Brulées, a 1993 Méo-Camuzet Clos de Vougeot, and a 1967 Cathiard Suchots, among many, many others. DO: Attend the Grand Tasting! That said, you absolutely must attend Saturday afternoon’s Grand Tasting, which features 34 of the best domaines from Burgundy pouring a selection of wines (usually four) from the most recently released vintage—in this case, the gorgeous 2010s. In many cases, these are rare, expensive, highly-allocated wines that you might not have a chance to taste, let alone buy, anywhere else. For a budding Burgundy collector like myself, it was an invaluable opportunity to gauge the vintage characteristics, but also to identify my own stylistic preferences among the varied producers. Without La Paulée, it would take months, if not years, and hundreds, if not thousands, of dollars to compare and contrast the styles of, say, Dujac versus Fourrier. I have only been drinking Burgundy for a few years, so I don’t have much of a reference point, but I can say this: across the board, 2010 was a fantastic vintage. The whites have amazing freshness, and are delicious now, but also have the structure to age (premox concerns notwithstanding). In particular I enjoyed the entire lineup from Christian Moreau of Chablis, and the Les Preuses from both Dauvissat and Fèvre, the latter of which practically pulsed with electric acid and minerality. The Bâtard-Montrachets from Pierre-Yves Colin-Morey and Leflaive also were predictably brilliant. Olivier Lamy’s wines, on the other hand, were reminiscent of chewing on wood chips. The reds were equally, if not more, stunning. Bright fruit, supported by ample acidity and substantial, but not overbearing, tannins. These wines were oh-so-tasty last month, but are built to last seemingly forever. The highlights of the tasting, for me, were Liger-Belair’s Echézeaux, Hudelot-Noellat’s Romanée St. Vivant, and Roumier’s Ruchottes-Chambertin. These grand crus are not cheap—they will eat into your retirement, but also will drink well into your retirement. For relative(!) values, look to the village wines of Gevrey-Chambertin (especially examples from Fourrier and Trapet) or Vosne Romanee (Mugneret-Gibourg and Hudelot-Noellat). I also very much enjoyed Lafarge’s whole lineup of Volnays. DON’T: Forget to pace yourself (or overdo it)! So you have to go to the Grand Tasting, but the Gala is only a few hours later that day. How do you do it? SPIT! Don’t drink too much (or any) wine in the afternoon, or your night will be ruined. Trust me; it’s a marathon, not a sprint. The Gala starts around 6:30pm, ends after 11:00pm, then the after-party, which lasts into the wee hours of the morning. La Paulée helpfully provides plastic spit cups in addition to your souvenir Riedel tasting glass, and buckets are everywhere (and are frequently emptied), so take advantage. There’s also some great food at the afternoon event, so don’t try to evaluate over 100 wines on an empty stomach! My advice also is to go back to your hotel and take a nap after the tasting, and maybe squeeze in a run or something. Whatever you need to do to prepare yourself for the big event. The Grand Tasting is not the place for wallflowers. You cannot be afraid to introduce yourself to strangers, and you cannot be reluctant to ask people for tastes of wine. If you stay put at your own table and never leave, you are severely limiting the number of wines you will get to try. Get up, move around, shake hands, and express interest in what others are drinking. BUT don’t be a jerk. Aggressive, but friendly, is the name of the game. If you act entitled to a taste, or worse yet, demand one, you will be shunned. Ask nicely, be gracious and complimentary. Jim Clendenen, proprietor of Au Bon Climat Winery in Santa Barbara, was at the other end of my table. He brought tons of great wine with him. I have never met him before, and none of my friends knew him, but I introduced myself anyway. Within minutes I had a taste of 2001 Henri Jayer Cros Parantoux in my glass. This may very well be the only taste of Jayer I ever have in my life (at over $5K per bottle, it’s a safe bet), and it was suitably amazing. If I wasn’t aggressively friendly, I would have missed out. This entry is part of my German Riesling Adventure, a weeklong trip to wine country last August. To read the rest of the posts, including the introduction, click here. 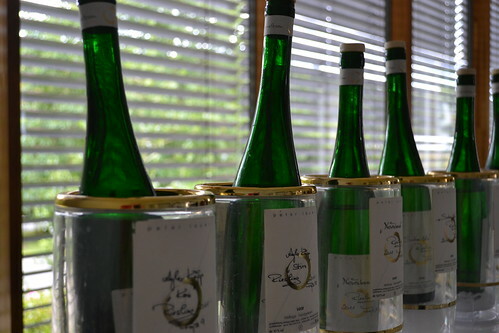 After our visit to Geltz-Zilliken, where we also tasted the wines of Peter Lauer as part of the SaarRieslingSommer festival, we drove to the northern Saar for an appointment at Hofgut Falkenstein. Hofgut Falkenstein is a relatively young (for Germany) winery, having existed around 30 years, yet everything about the place is traditional and makes it seem like it’s been around forever. The vines are old (over 70% are 30+ years old, the oldest are between 60 and 80). The grapes are harvested by hand and crushed in whole clusters with an old spindle press. The wines are fermented with natural yeast and aged in ancient 1000-liter oak casks before being bottled and labeled by hand. Like I said, old school. This entry is part of my German Riesling Adventure, a week long trip to wine country last August. To read the introduction, click here. We landed early in the morning in Frankfurt and, after trying in vain to figure out how to operate the car’s navigation system in German (which neither of us speak), headed out toward Trier, not far from where the Mosel River snakes its way into Luxembourg. We did some sightseeing but, as this was a wine tasting trip, we quickly had to make our way south into the Saar, a wine region along a main tributary of the Mosel. The Saar is a small area of winegrowing (so much so that it is easily forgotten now that it has been folded into the larger Mosel region on wine labels), but it has a handful of strong producers working with excellent terroir. Our destination was Saarburg, in the southern part of the valley, and specifically the estate of Weingut Forstmeister Geltz–Zilliken. Our visit happened to coincide with the SaarRieslingSommer festival, a weekend tour where nine different wineries – and several guest producers – opened their doors to visitors, and for a small fee you could taste all day at any of the stops. Therefore, while at Zilliken, we also were able to taste the wines of Peter Lauer. Like David, I was introduced to Lauer’s wines by Phil Bernstein, and was immediately hooked. The wines are made by Florian Lauer, part of the new generation of up-and-coming winemakers I mentioned in the introduction to this series. Four generations of winemakers preceded Florian, who is in his early 30s. The 2012 vintage will be his eighth, after taking over from his father, Peter. During an episode reporting on the Rudy K. case, the syndicated television program “Inside Edition” buys an allegedly fake bottle of 1953 Château Pétrus from Park Avenue Liquors in New York City. 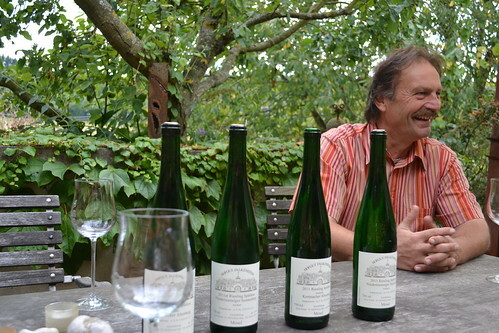 The 2012 vintage in Pfalz, Germany is setting up to be “absolutely amazing.” So says Bill Hooper for LarsCarlberg.com. Nicolas Glumineau, former chief operations officer at Chateau Montrose, is now taking over operating duties at the Roederer-owned Bordeaux estates Château Pichon Longueville Comtesse de Lalande, Château de Pez, Château Bernadotte and Château Haut Béausejour. In the New York Times, Eric Pfanner shows some love for Aglianico. It’s a grape frequently ignored for better known Italian varieties such as Nebbiolo or Sangiovese, but it can produce some remarkable, compelling wines in the right soils and hands that are as ageworthy as some top Baroli. “If you can forgive the schmaltz, these flights of fancy actually yield some scenes of legitimate poignancy.” Keith Levenberg pens the most honest review of the “Drops of God” books yet. You can’t avoid it this time of year: Thanksgiving wine recommendations! In Bon Appetit, Levi Dalton has a unique perspective on pairing. Eric Asimov also strays from the traditional advice, suggesting a Hudson Valley Tocai Friulano, among others. In the Wall Street Journal, Will Lyons introduces readers to the charms of Madeira, an under-appreciated fortified sweet wine from a tiny volcanic island off the coast of Morocco. “There were wooden cases of wine stacked all the way to the ceiling — wines of impeccable pedigree and provenance, but in a bit of a perilous jumble.” Elsewhere in the Journal, Lettie Teague gets a rare peek inside Robert Parker’s 10,000-bottle wine cellar. “Watch the broken glass,” Parker cautioned. For Eater.com, Talia Baiocchi provides a guide to 22 restaurants with some of the best value wine lists in the country.